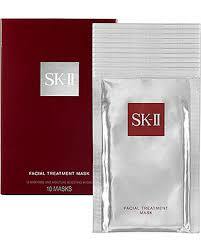 SK-II Facial Treatment Facial Sheet Masks are packed with PITERA which will immerse your skin with hydration. These facial masks will improve radiance in your skin after one application. You will love the plumping effect as well as how silky soft your skin becomes. PITERA is SK-II's miracle ingredient which is derived from yeast fermentation. It actually resembles our skin's natural moisturizing factors. It contains over 50 nutrients such as vitamins, minerals, amino acids and organic acids. You can use the SK-II Facial Treatment Mask once or twice weekly for renewed radiance. It is best to use it after cleansing and toning.